Monarch players enjoy the convenience of a luxury clubhouse located behind the third base dugout. The complex also houses all of the baseball offices. There are on-going efforts to improve “The Bud” and help make it one of the top facilities in all of college baseball. 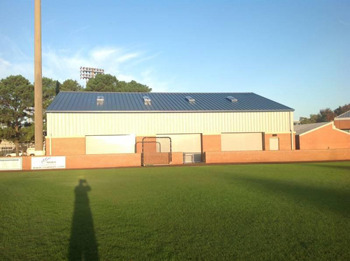 In the last five years 1.5 million dollars have been spent with recent renovations including a state-of-the-art indoor hitting facility, new outfield wall, brick down the foul lines, a new sound system, brand new lockers and updates to the current locker room. In August of 2015, the dugouts will have new team benches, rubberized flooring and new graphics. The playing surface dimensions measure 325 feet to right and left field and 395 to center. The playing surface itself is often compared to that of a major league park, this is in large part because of the dedication and hard work of Michael Conrad and his crew who oversees the everyday upkeep and field maintenance.